Places to see in Raichak: The prime tourist attraction of the region is the Raichak Fort, which was built by the British East India Company in the year 1783. However, post-independence the fort was in deplorable condition, which was undertaken by the Carlton Group of Hotels and the Bengal Ambuja Group in the late nineties and was transformed into a deluxe resort – Radisson Fort. Though entry at the site is restricted only for the guests, but you can highly savor the wonderful sight of the resort. The hotel also treasures some memorabilia of the British period, which include a clock, a grand piano, perfume bottles and swords. You can also visit the port city of Haldia situated on the other side of the river Hooghly. Nearby attractions around Raichak: If you want to explore further afield, organize an exciting trip to Diamond Harbor, 15 km from Raichak. Diamond Harbor used to be a bustling port of the British, where you can still find large ocean vessels. Tourists are truly amazed by the natural beauty of the place. The site also houses the ruins of an ancient Portugese Fort called Chingrihkali Fort, known as the refuge of the Portugese pirates. You can also spot a lighthouse at the site. Many tourists also visit the Ashram of Sharisha Ramakrishna Mission located here. You can also enjoy a tour in the neighboring township of Joynagar or visit nearby Gadiara. 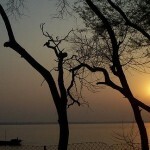 Things to do in Raichak: Savor the scenic beauty of Raichak and the spectacular sunset on the river Hooghly. The ferry rides or the boat rides from the Raichak Jetty and Nupur Jetty to Gadiara or Kukhrahati is truly exciting. Relish the scrumptious Bengali cuisines available at Raichak. In visiting Diamond Harbor you can also book a daylong river cruise trip. How to reach Raichak: Raichak lies at a driving distance from Kolkata. You should drive down the Diamond Harbour Road from Behala in southern Kolkata to reach Sarisha in about 30 mins and take a right turn just before Diamond Harbour. Raichak is another 5 kms from here. Best time to visit Raichak: The ideal time of visiting Raichak is during the period between October and March, when the temperature drops down and becomes pleasant. Lodging and dining facilities in Raichak: Apart from Fort Radisson, you can also get budget accommodation options in Raichak.